At Durga Plastchem Pvt. Ltd., we have a passion for what we do; innovation lies at our heart and we strive to improve ourselves nurturing the tradition of total customer satisfaction. Our company was established in 2003 and within a very short period, it has reached the zenith of success by virtue of unique technical expertise and an uncompromising quality driven attitude. 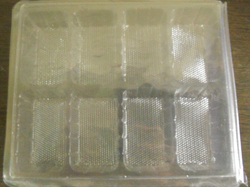 Today, we are regarded in the market as the ultimate destination for quality Disposable lids & Blister Packaging.